Home Has Pinterest.com been hit by Google’s Interstitials Update? Within the past few weeks, we released our Winners&Losers list for Germany, the United Kingdom and Spain. One domain that stood out for their SEO-success in 2016 was Pinterest.com. We even linked to an interview with Casey Winters, former growth product lead at Pinterest, where he explained how important SEO is for Pinterest and its strategy. Nevertheless, one week after releasing the article, we observed a remarkable drop of Pinterest’s mobile Visibility in Google’s most competitive markets. In spite of the fast recovery of Pinterest.com, we can clearly see that this domain lost 40% of its smartphone Visibility in the UK, 35% in the USA, 34% in Germany and 34% in Spain. Today, the Visibility is still -16.5%, on average, in all countries where we collect our weekly data. To get an idea of the impact of this drop, we could use the data for the UK. In this country Pinterest.com lost 40% of its Visibility on mobile, which makes it a drop of 167 Visibility points. From initially 417 points, down to 214 points. The entire domain Mirror.co.uk only has 165 Visibility points, Linkedin.com has 160 and Independent.co.uk 144, in total. It’s already been a month since the roll out of Google’s Interstitials Update, but we preferred to wait and see how this new Interstitials Update works and if we could see the same pattern in others domains, which likely have been penalized, too. 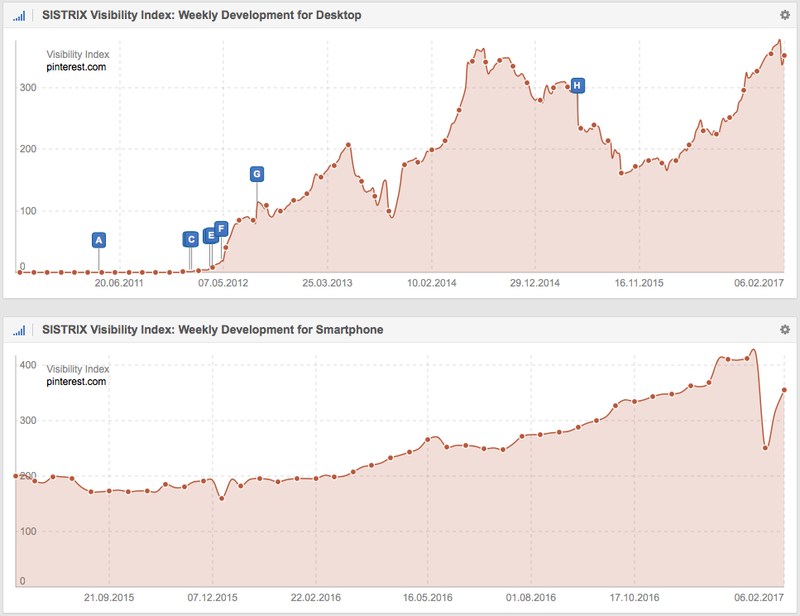 Many domains that use interstitials and lost mobile Visibility in the same time frame, like Whosampled.com, Instructbales.com or Bose.co.uk, show a similar pattern. Ranking distribution with the absolute amount of rankings on the first 10 results pages. (1) Content shown on Smartphones. (2) The same content shown for Desktop. Hey, well spotted! In France it looks like they were affected too, mainly dropping dozens of positions on brand names. Personally, I’m glad to see Pinterest get hurt. I am not a fan of their use of interstitials to hide content from non-members. If I am a member of Pinterest, and I’m putting up things for sale, my potential customers should not have to become members of Pinterest just to be able to see my content. Membership should only be required of those who want to post. This has been the main reason I have not yet started using Pinterest. Why use a site that the vast majority of my potential customers are not allowed to view? Hopefully they will soon be hit for their use on desktops as well. Wow. Great insights here. Definitely, nobody is safe with updates. Even the big names. Interesting Insights. I was looking through this last december when all I saw for most of keywords were pinterest search results over the first page.. Excellent work, I was wondering who would get slapped. I think this is an interesting area where they leveraged SEO for growth, then growth hacked signups with the interstitials (which are terribly annoying) and then got slapped for that. It’ll be interesting to see their next move.